As a child, I was subjected to annual Guy Fawkes’ Night warnings about the perils of touching hot sparklers and returning to fireworks once you’ve lit the touchpaper. This year, I found that I spent much of Chinese New Year shouting ‘No! Don’t…’ as small children lit metre-long sparklers and searched the streets for unexploded ordnance the day after CNY. My top sighting? A pair of unattended three-year olds expertly setting off miniature firecrackers with a lighter. The photo above shows my own purchase – an entire firework display in a box – and the shopkeeper trying not to drop it. In 2002, I spent CNY in Hunan, sustained on a hearty diet of pork and chilli peppers. 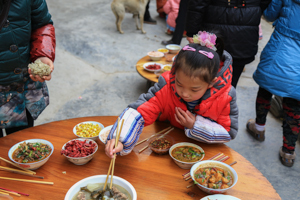 It turns out that Guizhou isn’t so different to its neighbouring province when it comes to preferring pork. 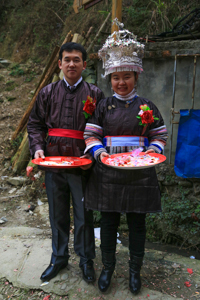 Chinese New Year is an auspicious time for weddings, which are spoken of here in terms of the number of pigs needed to feed the guests. Where we might say ‘They had five hundred guests’, Zhaoxingers would say, admiringly, ‘That was a five-pig wedding’. I try to be an open-minded eater when I’m travelling – eating is often a wonderful entrée to local culture (pun intended). However, on this trip I met several occasions where I was happily eating something, only to find that my appetite evaporated when I was told exactly what it was. Pork tossed in raw pig blood provided one of those moments, as did anyu, a raw fermented fish. Both actually tasted okay – until I found out what that vivid, red sauce was in the first instance, and that the anyu can be aged for years before it’s deemed ready to eat in the second. However, no ill effects were felt from eating either dish, I’m happy to report. For some reason, I forgot all about the need to give hongbao at Chinese New Year. (For the uninitiated, hongbao or laisee, as they’re called in Hong Kong, are red envelopes containing cash that are given out at Chinese New Year and weddings for good fortune in the marriage/year ahead, and to help offset the cost of all those pigs.) This year, I found myself in the embarrassing position of not having much cash with me and needing to put together hongbao for a wedding and the New Year. Don’t make the same mistake! Take plenty of renminbi cash with you, just in case you can’t find a cash machine or you find that nobody wants your worthless greenbacks (as happened in my case). 5) Don’t forget your earplugs! 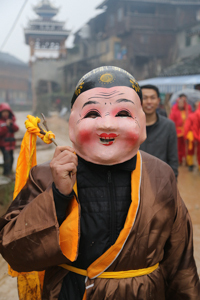 Phase 2 – Bad time to be a pig (New Year’s Day to the third day of the New Year): The most auspicious time for xishi (happy events) – like weddings and baby naming ceremonies, and sangshi (unhappy events) – funerals. Both happy and unhappy events involve big pork-based meals, hongbao and copious amounts of firecrackers. Domestic tourist numbers peak between the second and fourth days. Phase 3 – Party time! 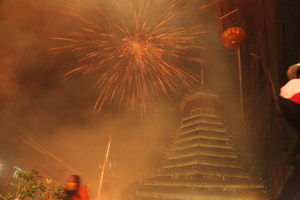 (4th to 10th days of the New Year): Once all the in-family celebrating is done, village festivals kick off – this is the best time to be here, if only you can find where the action is (see #7). 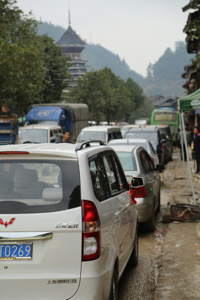 While my journeys to and from Zhaoxing were much smoother than I anticipated, I was very lucky – particularly on my return journey, where I picked up the last ticket on the last bus back to Guiyang. If you’re travelling on a tight schedule, or with a group, book as much as you can ahead of time to avoid spending more time than you’d like hanging around transport hubs. 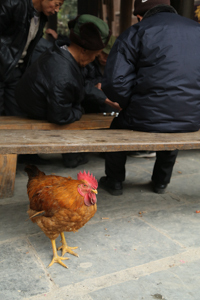 When I was in Zhaoxing, I walked (a lot, mainly to keep warm) and hitchhiked to get around. While I wouldn’t hitch in the vast majority of places, I’ve always had pleasant experiences doing it in China. On one occasion, four boys on two motorbikes stopped and asked if I wanted a ride. When I said ‘No, you don’t have room’, they rearranged themselves – three on one bike, one on the other – so that I could ride pillion back to Zhaoxing after a long and muddy hike. The spirit of chivalry lives on! P.S. If you would like to find out where Zhaoxing is, you can see a map of the places I visited here.